This thermoset single ply roofing membrane is called EPDM (ethylene propylene diene monomer). EPDM Single Ply Rubber Roofing offers high performance, has superior weather-ability through a wide range of Chicagoland temperatures and conditions and demonstrates excellent ozone resistance. EPDM Single Ply Roofing System is an elastomeric roofing sheet ideal for either new roofs or re-roofing over a variety of common Chicagoland roof deck types and insulation materials. Some of the other features that contribute to the popularity of EPDM Rubber Roofing in the Chicagoland area include excellent resistance to sunlight, moisture, ease, speed, and cleanliness of installation. This lightweight synthetic elastomer material has been used since the early 1970’s.and is very adaptable. 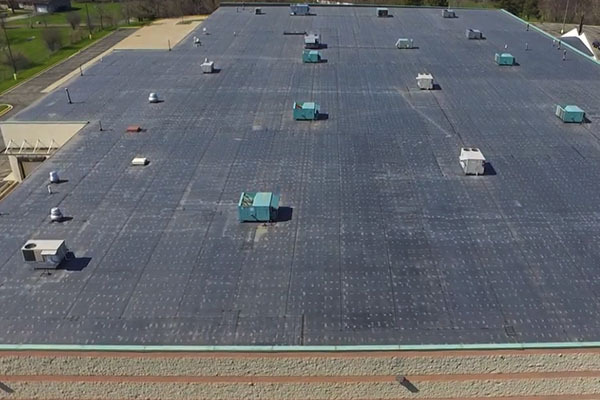 Varied application techniques such as ballasted, fully adhered, and mechanically fastened, allow EPDM Single Ply Roofing Systems to be applied to virtually any Chicagoland roof surface: flat, spherical, curved, or slanted. EPDM Roofing Systems are a reliable option for Commercial and Industrial buildings that require fewer roof repairs and maintenance. Rubber roofing, used commercially for many years, is now finding its way into more Chicagoland residential roofing projects as well.